Investors are flooded with information at the end of the year. There are many articles that review the year in the markets and offer lists of the best performing asset classes. Generally, stocks end up near the top of that list. Over the long run, stocks have delivered returns that beat inflation and provided compensation for the risks associated with investing. This, of course, applies to the stocks as an asset class rather than any single stock since a company may or may not be able to deliver above average investment results. But in 2018, major stock market indexes closed down and that led to other asset classes being at the top of the list. Unfortunately, the best performers may not be available to many individual investors. In an end of year retrospective in The Wall Street Journal, art, wine and cars were cited as the year’s best investment opportunities. The article noted, “Who beat the market this year? Investors who like the finer things in life. 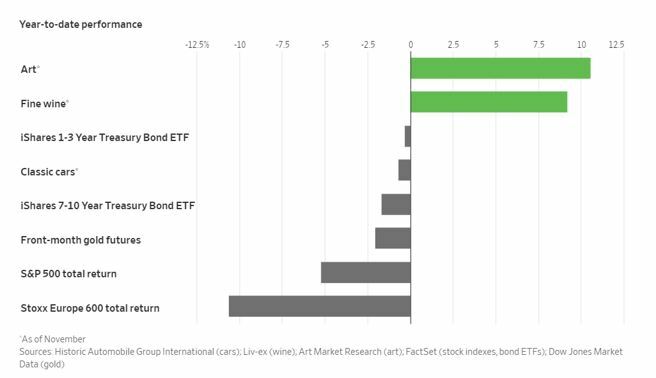 Luxury assets, including wine, art, classic cars and fancy colored diamonds, have outperformed stocks and bonds this year. 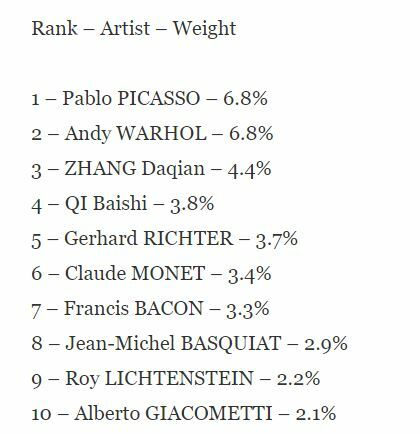 Investors who put money into art at the beginning of the year saw an average gain of 10.6% by the end of November, according to Art Market Research’s Art 100 Index, the closest thing the industry has to a benchmark. One index of fine art shows this performance has been intact for years. This index consists of the work of 100 artists. The top 10 are shown in the chart below. Many of these artists are out of reach of the average investor because of their limited availability and high prices. 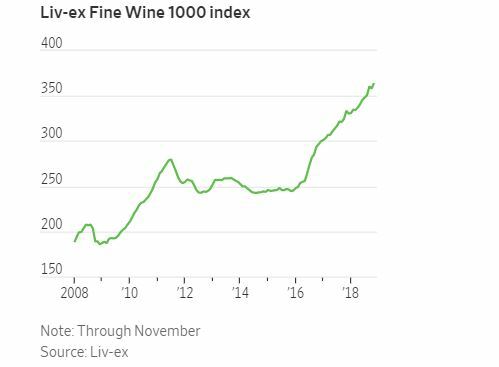 The Wall Street Journal also noted, “Those investing in wine have seen a 10.2% gain this year, according to the Liv-ex 1000 index, a broad measure that covers wines across regions. Meanwhile, those who own luxury investments can revel in their relative staying power. The market for high-end diamonds has been steady, gaining 0.4% in value in the first three quarters of 2018, according to the Fancy Color Research Foundation in Tel Aviv. Eden Rachminov, chairman of the FCRF, a diamond-industry body, says the gemstones can help diversify an investment portfolio and there is almost no volatility in prices. 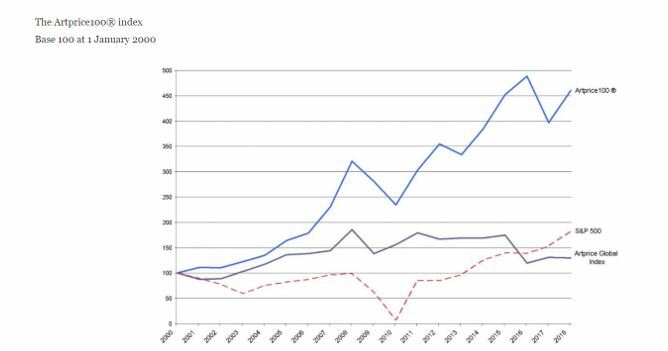 There are risks involved in holding alternative assets, from regulatory reform to changing tastes, such as a recent shift in demand beyond traditional Bordeaux wines to top-end Burgundy and other varieties. And the wealth effect that people feel from higher stock markets can reverse itself quickly. “If people make money on the stock market, they have more money to spend on their hobby,” said Dietrich Hatlapa, director of Historic Automobile Group International. 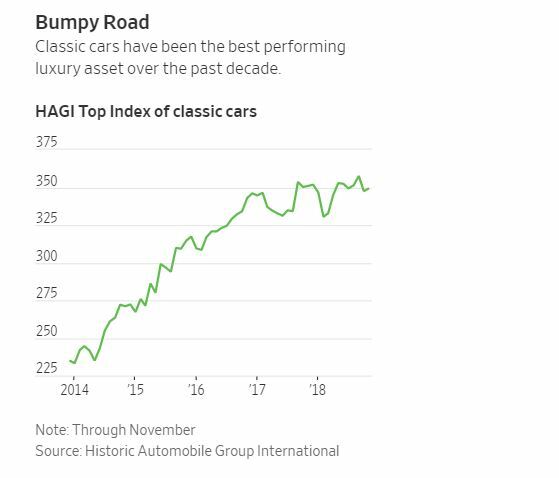 Luxury-car prices were down slightly this year, according to HAGI’s Top Index, which covers rare collectors’ automobiles—a correction, Mr. Hatlapa says, that was expected given the rate at which investors poured money into the vintage-car market following the 2008 financial crisis. “They decided to allocate more to classic cars as part of their portfolio because they couldn’t find returns elsewhere, but there are more alternatives as interest rates normalize,” he added. Cars have been the best-performing luxury investment over the past 10 years, gaining 289%, according to a report published by Knight Frank earlier this year. Coins gained around 182%, wine 147% and jewelry 125% over the same period, while antique furniture and Chinese ceramics lost value. Emerging markets represent a large part of demand growth for luxury assets, leaving prices vulnerable to moves in currency markets too, analysts say. Wine analysts point to the boom that followed the United Kingdom’s decision in 2016 to leave the European Union. Political uncertainty over Brexit dragged on sterling, the main currency for trade in wine, creating a buying opportunity for international investors. At least one company is attempting to open the art market to small investors. The company purchases blue-chip paintings for millions of dollars—and gives investors the opportunity to purchase shares in a special purpose entity that owns the specific piece, from investments starting at $500. Masterworks has been featured by CNN, Forbes and the Wall Street Journal and is offering shares of paintings by such luminaries as Claude Monet and Andy Warhol. “Outside of technology start-ups, I’ve made higher returns investing in art than anything else,” Scott W. Lynn, founder of Masterworks, says. Paintings at this level, however, have historically only been available for those ultra-high networth individuals. Masterworks is working to democratize fine arts investing. Investors can now purchase shares and see returns through the sale of the painting or trading. To accept payments for shares electronically, Masterworks turned to Dwolla, a payments platform. Dwolla, Inc. is a financial technology company that offers businesses an onramp to the Automated Clearing House Network, an electronic network of financial institutions that moves $43 trillion dollars annually. Masterworks’ users send funds to an account that Masterworks has set up for each individual piece of art. These transactions happen across the ACH Network using the Dwolla integrated API. This is certainly a risk but individuals may want to diversify and art is certainly one opportunity for diversification.